Saga offers financial and travel services to those aged 50 and over. It sells a wide range of insurance products, including home, travel, car, medical and life. See if Saga features in our guide to the best life insurance policies. Saga offers two types of life insurance: Term Life Insurance and Guaranteed Life Insurance. The former offers insurance for a fixed term and is designed to cover things like your mortgage if the worst were to happen to you. The latter does what it says on the tin: it guarantees a lump sum payout and acceptance to anyone if they’re aged between 50 and 75. Saga won’t make you answer any questions about your health or take a medical and you’ll be eligible for a full payout after a year of the policy. Saga's Term Life Insurance is provided by Legal & General and their Guaranteed Life Insurance by VitalityLife. Term Life Insurance is split into two separate policies: Life Insurance and Decreasing Life Insurance. Life Insurance offers a fixed lump sum in the event of your death. This may be an option if you are looking to cover an interest-only mortgage, or if you want to leave your family some security if you die. Decreasing Life Insurance means the value of your policy decreases over time. You may want to consider this if you want to use your life insurance to pay off a mortgage that will steadily get smaller as you pay it off. It can be cheaper than opting for a lump sum, depending on the value of the policy. For both products, your premiums are guaranteed to stay the same throughout the length of the policy. You can also take out Critical Illness Cover and Waiver of Premium, for an additional cost. Critical Illness Cover will pay out a cash sum if you are diagnosed with one of the illnesses Saga specifies within its policy terms. Waiver of Premium means that you will be helped with your premium payments if you become too ill or injured to carry on doing your normal job. Both of these policies include Accidental Death Benefit while your application is being processed, either for up to 90 days or until Saga accept, postpone or decline your application. That means if you die in this period the company will pay out the amount you’d asked to be insured for, up to a maximum of £300,000. Saga’s policies also include Terminal Illness Cover. If your policy term is over two years and you’re diagnosed with a terminal illness that leaves you with a life expectancy of 12 months or less, Saga may pay out a lump sum. Guaranteed Life Insurance is available if you are between the ages of 50 and 75. The maximum sum assured is £18,887 and it will only pay out 12 months after the policy’s start date. Policy premiums are payable until the policy anniversary after your 90th birthday. Saga's Guaranteed Life policy doesn’t require you to answer any medical questions or complete a medical examination. The company says your premium will never change and your payout will never decrease, although it warns that "due to inflation, the sum of money you arrange to be paid out might not be as much in the future as it can today". There is the option to include Funeral Benefit, which means the costs of your funeral will be covered by your policy and Saga will arrange for the funeral director to contribute £250 towards your funeral. Saga will also give you a £40 Marks & Spencer gift card after your third monthly payment. For more information on the different types of life insurance, check out our guide to the best life insurance policies. How much does Saga life insurance cost? The cost of life insurance will depend on a range of factors, including your age, any health problems you have, and where you live. It’s essential that you fill out their forms as accurately and honestly as you can, as if you get something wrong it may affect a claim. If your details change, make sure to contact Saga to let them know. Saga says premiums for Term Life Insurance start from £6 a month. On the online quote form you can set the amount of life insurance you would like or the amount you would like to pay each month. Guaranteed Life has a minimum monthly premium of £10 a month and maximum of £50 a month. What do the customers say about Saga life insurance? 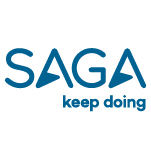 On Reviews.co.uk, Saga scores 4.46 out of 5 stars based on 247 reviews. That score is for the business as a whole, and not its life cover specifically. On Trustpilot, Saga score 7.5 out of 10 based on 334 reviews. What do the experts say about Saga life insurance? Saga’s Guaranteed Life Insurance has been awarded a 3 Star rating from the independent financial review service Defaqto. A 3 Star rating indicates “a standard product” which provides “an average level of features and benefits”. Learn more about life cover with our guide to the best life insurance policies.